UC Browser, one of the most popular mobile web browsers in China and India, is no longer available at the Google Play Store. 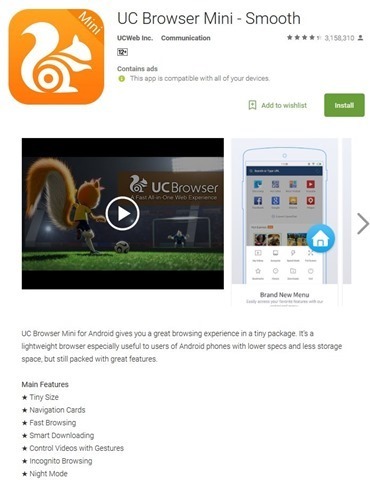 UC Browser, is owned by UCWeb, which in turn is a mobile subsidiary group of Alibaba. Alibaba has more ties with India, being an investor in both Snapdeal and PayTm (and One97). About 3 months ago, a report emerged which suggested that the browser could be banned in India. According to an investigation by the University of Toronto and the Centrefor Development of Advanced Computing (C-DAC) Hyderabad, UC Browser was found to be sending personal data of Indian users back to its servers in China. The report also alleged that the app collected data even after it had been uninstalled from the device, through DNS routing. The app apparently had 100 million monthly users in India, and has a global user base of 420 million. This is most likely due to the fact that Google is banned in China, and hence users from the region need an alternative. If you go to the Play Store listing for UC Browser, it says "not found". It is unclear why the app has been removed. It is possible that it has been banned for data theft, though no official announcement was made by Google. If it is the case, Google may use Play Protect to remotely uninstall the apps from user devices. Oddly though, UC Browser Mini is still available on the Play Store.